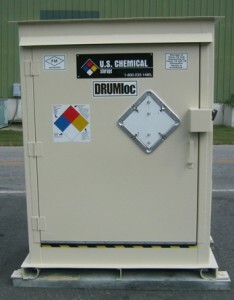 Drum storage requirements are intended to prevent hazardous materials from being released. Chemical safety regulations are designed to protect personnel in the event of an accidental spill or leak. Chemical plants regularly handle hazardous materials, therefore proper chemical storage regulations must be followed. When it comes to chemical drum storage, adhering to safety regulations and storage guidelines can prevent the environmental and health issues involved in a chemical spill. Should a spill occur, our leak-proof secondary containment sump can control the spill and prevent it from escaping the area, leaving it for you or a hazmat team to safely remove. In addition, drum storage buildings should be secure; door locks can prevent personnel or visitors from the hazards of accessing chemical drums. US Chemical Storage offers roll-up doors, and wide double leaf hinged doors for easy access with a forklift. Our Drum Storage buildings offer easy accessibility along with maximum strength and security. Customizable features such as our drum-crane hoist can be installed for maximum efficiency. Our crane hoist system delivers unmatched efficiency when spaces are too tight to squeeze or too small to fit a forklift. The suspending crane and hoist system facilitates the ease of moving and storing drum containers efficiently and effectively to minimize your manufacturing operation costs. Our crane and hoist system meets ASME/ANSI B30.16 and OSHA Standards. The abrasion resistant crane and hoist system is designed for heavy-duty chemical storage applications, and can withstand heavy chemical storage drums. Increase your production and keep your storage organized with our crane and hoist system. Our drum storage buildings can be furnished with a variety of accessories to maximize safety within your facility. In addition to a secondary containment sump, your drum storage building can include access ramps, lighting, and fire suppression systems, making your storage procedures safer and more efficient.